Wooden Horse ManikinConstructed of smoothly finished natural wood. Fully posable and adjustable. Ideal for sketching drawing painting and use in still life compositions. This horse is approximately 12 inches long from nose to tail. 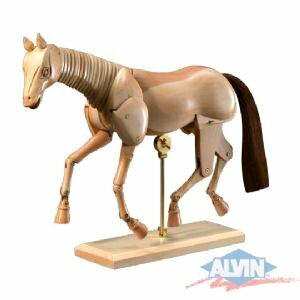 Wooden Horse ManikinConstructed of smoothly finished natural wood. This horse is approximately 12 inches long from nose to tail.